It’s been a bit more than a week since the Smash for Switch teaser trailer hit the internet, and people have been wildly speculating and hyping the game since. 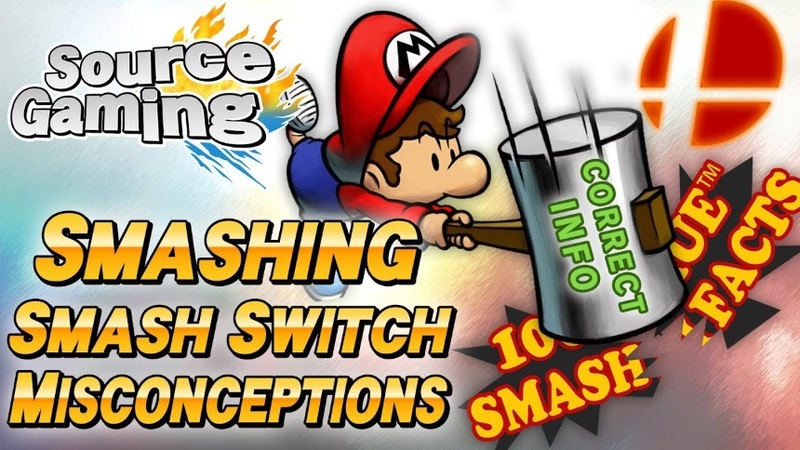 While there’s nothing wrong with rampant speculation, we’ve noticed that there are some pieces of information that are being misinterpreted or are outright wrong, so it’s time to smash some misconceptions about Smash for Switch! A lot of people mistakenly believe HAL Laboratory is developing the game. This is a pretty common misconception that we’ve seen disseminated even by major outlets, and prominent Youtubers. They state HAL is the studio behind this game because of the “Original Game: © Nintendo / HAL Laboratory” at the end of the teaser. Unfortunately, this doesn’t actually confirm anything. This copyright was present for Brawl trailers as well as Smash for 3DS/ Wii U trailers, and only means that HAL jointly owns the Smash Bros. series with Nintendo, due to being the original development studio behind the game. Bandai Namco wasn’t present in the credits of the Smash for 3DS/ Wii U trailers until much later as well, so these credits don’t actually tell us anything about what studio is developing the new Smash. 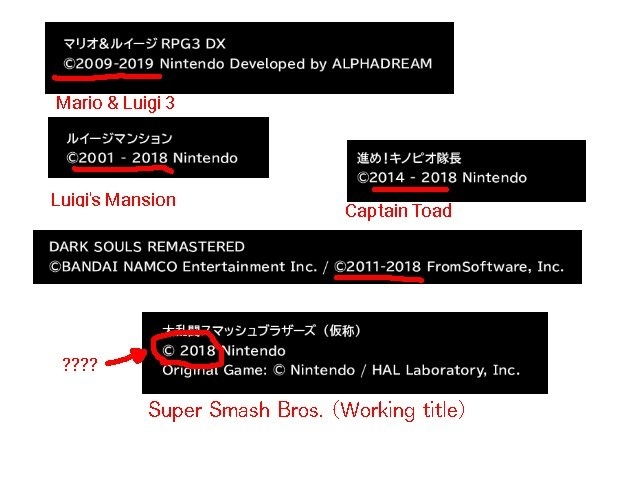 This image highlighting the copyright years of other ports that were present at this particular Nintendo Direct also made the rounds as part of the evidence for Smash for Switch being a new game. All the other ports included the original year of release in the range provided, while Smash for Switch only had the year 2018. However, this is also a misconception-- Pokken Tournament DX only had 2017 for its copyright year, and same goes for Mario Kart 8 Deluxe, both of whom were also mostly ports, even if they did have added content. This is another piece of evidence that’s really far more ambiguous than people seem to think, as it doesn’t really confirm anything about the nature of Smash for Switch, and how close it may or may not be to a new game. While the gap in release dates between Melee and Brawl, then Brawl and Smash for 3DS/ Wii U, were both fairly long, lasting roughly 7 years, in terms of development time, Smash for Switch releasing in 2018 isn’t particularly egregious. Full-scale development of Smash 64 began in September of 1997, and the game released in Japan on January 21st, 1999, totaling roughly 17 months of development time. Melee’s infamously rough development cycle lasted only 13 months, while Brawl took 2 years and 3 months. It’s unclear exactly when Smash for 3DS/ Wii U development began because Sakurai submitted a project proposal April 26th, 2012, but it was likely somewhere between 28 and 30 months, around 2 years and 5 months. Sakurai said that development on Smash for 3DS/ Wii U wrapped on February 10th, 2016, and casually mentioned that he was working in a studio again in November 2016. (See the development time breakdown here) Sakurai said he was taking a short break after DLC, and knowing Sakurai, he probably wasn’t taking a break for long. If he got back to work within a month, even a September release date for Smash for Switch would put the development cycle at 2 years and 7 months, which is definitely enough time to work on a new Smash game. And that’s assumed there was no work being done concurrently on Smash for Switch and Smash for 3DS/ Wii U-- which isn’t impossible when you recall the “Smash 6” job posting from April 2014. While the logo animation does look similar, Brawl also has a very similar transition. So it’s animation that’s been in half of the games in the series-- not something unique to Melee. And while it’s fun to fall into conspiracy theories, the logo animation, at least, is not secret proof that we’re getting Melee 2.0. It probably just means that they wanted to go back to that animation. Not to mention, that logo is merely a placeholder before the final name. So the new logo could very well have a completely different animation. The Apocalyptical Smash Ball theme. If you look at past Smash trailers, especially the Smash for 3DS/ Wii U ones, they all had one common trait in introducing the character. Smash 3DS/ Wii U had the splash screen and slash animation, while Brawl had the names appear on the screen. However, just because those animations appear uniform, it doesn’t mean they were determined by the introduction trailer. An introduction trailer’s purpose is to introduce players what they can look forward to in a game. It even says it in the name, introduce. So, because it has the goal of capturing the player's attention, it’s not necessarily going to follow the conventions of subsequent trailers. For example, the introduction trailer for Smash 3DS/ Wii U had no single slash in the trailer whatsoever. While it would be cool to see that animation appear in each trailer, it isn’t an absolute guarantee. The character silhouettes and the Smash Ball were to let people know what they were getting into. And future trailers will most likely be made with the notion you already saw the teaser. The original article was written by Soma and epicmartin7 with edits by PushDustIn. Despite all this, it's still fun to speculate on what is will end up becoming so long as you don't let your expectations run rampant. 2 years & 7 months I think is stretching things, though I do agree that there is enough time for a new game. Except that the cross bar is inside out with flames opening up rather than the whole smash ball being on fire. Also the cross slash is part of every game. With the cross flash being first in the E3 2013 trailer, we immediately know it is smash. However, the first teaser trailer (and only teaser trailer) shows both Inklings shoot ink and things get so dark and fiery bright that we know a new smash game is imminent. Yeah, I thought that's what OP meant that the first trailer for Smash 4 deviated from the same intro style of subsequent ones but it didn't. There wasn't a teaser like this for Smash 4 to judge from that. Something else to keep in mind with the development time is that Smash 4's development time was split between 2 games, granted design choices were shared but assets were not. So it is very likely that the devs could easily make a new smash game based off a modified version of the WiiU engine in as short as 12 months, especially if many of the assets are either reused or modified/enhanced from the previous game; which why not? The game looks great on the WiiU and wouldn't need much outside of some tweaks here and there to character models and animations. Also worth noting: the logo animation was also present on the Japanese intro for Smash 64, so it's not even something Melee introduced. Eh, the gap between each Smash game release (except obviously 64 to Melee) is more like 6 years than 7 (Melee —> Brawl; December 2001 —> January 2008 —— Brawl —> 4; January 2008 —> September 2014). Yeah. 3DS and Wii U shared a roster and core mechanics, but they have different art assets, game modes, etc. Also worth noting that Smash 3DS re-used a lot of art assets from Brawl (for instance, Link's 3DS model is just his Brawl model with different textures. ), so them re-using old art assets for a new game has precedent. I think it'll be an entirely new game rather than a port. If it were a port, Nintendo would have mentioned it sooner, possibly even before the Switch's release. I really, really doubt they'd make a trailer they knew would blow up if it were just a port + Squid DLC.